Our collection of games like Monkey Quest features other free massively multiplayer online games that are full of action for the young children demographic. Monkey Quest started in 2011 and quickly became a popular past time for many children with its action orientated approach to gameplay that keeps players active while engaging them in learning through various means. Set in the mystical land of Ook Monkey Quest challenges gamers to interact with the inhabitants of this virtual setting helping them with any needs that they have. These quests form the basis of your experience as you travel the land meeting new characters, gaining friends, buying equipment and more. With five different tribes and plenty of quests Monkey Quest promises to be a very exciting experience for all ages as you discover the mysteries that await you in the mystical and virtual land of Ook. 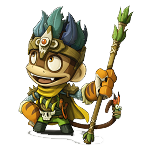 The games like Monkey Quest that you will find here focus on other action based MMOs that let children jump into an immersive virtual world and role play as a character while completing quests, improving their avatar and making new friends. These included games are predominately browser based but also includes a few downloadable titles.